Sometimes you just have to pick a spot and see what you see. 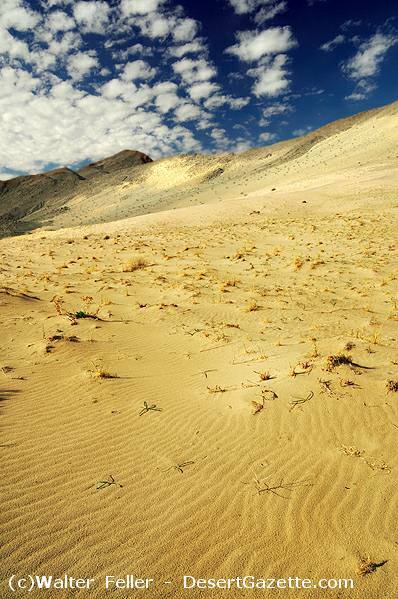 A dry lake (playa) in an overlooked basin. Where to start? Someplace that looks interesting. These appear to be inactive dunes. 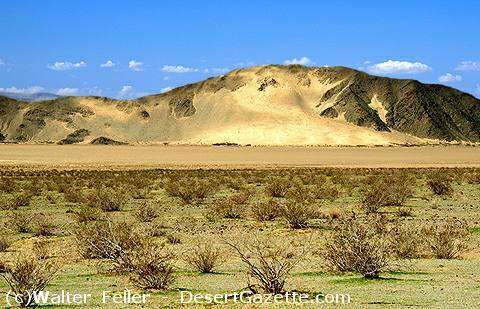 Active sand dunes do not have so much vegetation as the sand hasn't stabilized. As I wander, I wonder- Are these just sand dunes? -Probably. But then again, maybe at one time they were a sandy beach. 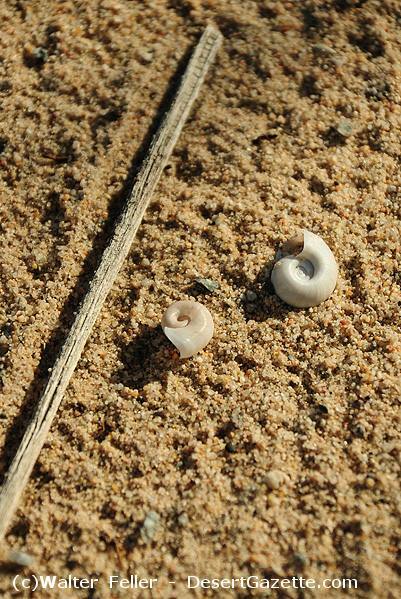 These shells are possibly from helisoma trivolis, typical freshwater snails found in many aquariums. 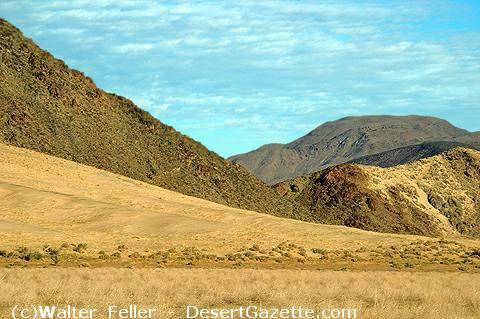 Odd being so far out in the dry desert. However, they are probably remnants from a time when this playa was filled with water perennially--A condition which ended maybe about 4,000 years ago. There were also pieces of Anodonta californica, a freshwater mussel, lying about. Arroweed grows where the water table isn't too far below the surface. 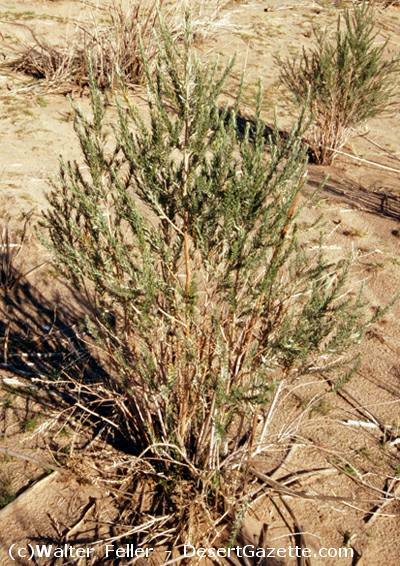 Indians would use the straight branches of the plant to make arrows. Possibly, up until whitemen took control of the area, Indians may have either lived here (in wetter times), or visited the area to make use of its resources (mesquite, arroweed, hunting small game, etc). Ah yes, a sign of the indigenous people. Something interesting about a shard like this is that the local indians had neither the materials or technology to make or fire these vessels. 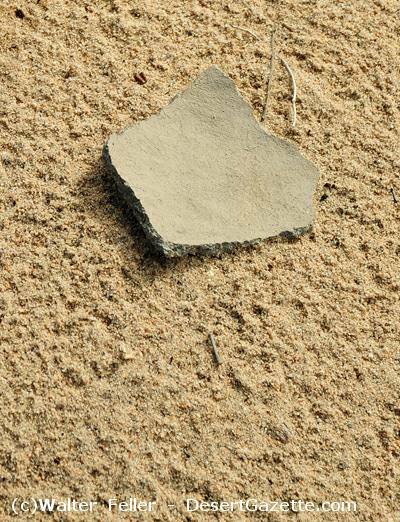 Pottery and shards when analyzed may have come from origins several hundred miles away. Archaeologists use this evidence to help define possible trade routes and associations between the desert Peoples. * Note- please leave artifacts where you find them so that others may enjoy them. It's the law. Tracks of a raven and a snake. The raven tracks were pocked by marks from raindrops, an indication that it had passed before the rain occuring two days before. 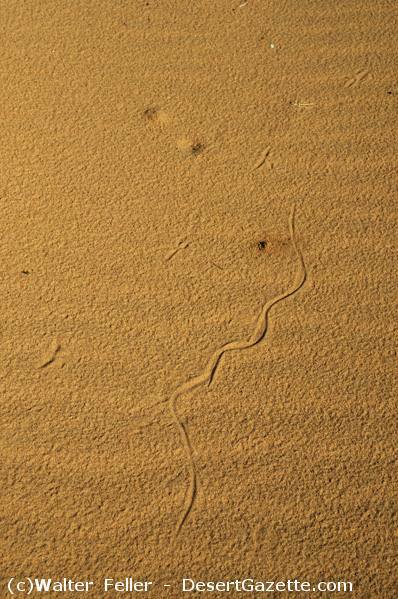 The line in the sand from the snake was after the rain, and smoothly scribed in the sand. After all was said and done, it was a beautiful day to explore this and other bits of the natural and human history I had found on my mini-adventures in the basin.